The National Park Service's Rosie the Riveter / World War II Home Front National Historical Park encompasses a growing identity that is as complex as its long name. Still in its formative years, the Park embraces the stories of a war that forever changed the cultural fabric of life in the United States. 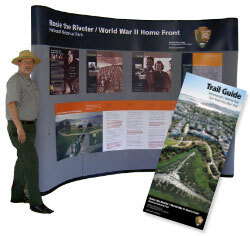 Its identity and integrity are anchored by the National Park Service banner and symbol. The spirit of a generation whose efforts were focused on unity of purpose inspires the generations that follow. Photos and stories collected by the Park and combined with resources from private and public collections, libraries, and museums inspire those who can only imagine past events. Many layers of information collectively tell a story that happened over 60 years ago. The ramifications of the World War II Home Front response by business, civic, and national leaders are with us forever. 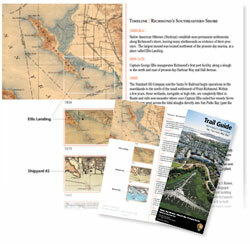 These maps, together with a current aerial kite photo of the same region, give geographical context to the stories of human impact on the San Francisco Bay shoreline. Community appreciation of this 4-mile stretch of public trail with abundant historic/scenic views, a restored watershed and recreational sites is the goal of the Marina Bay Trail User Guide Committee. 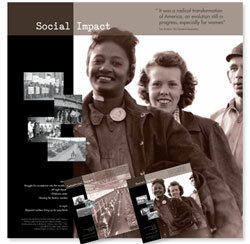 Midst the WWII Home Front stories of struggle, pride and determination, much remains to be understood and discovered. 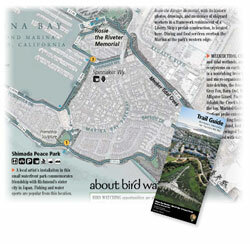 A useful pocket map becomes the invitational tool and opportunity.